Are you trying to add drama and beauty to your shady spots but keep finding only bland, lackluster plants? 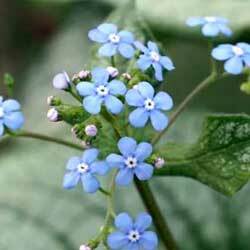 You won’t want to overlook Brunnera macrophylla ‘Jack Frost’ with its stunning appearance and easy care. Also called Brunnera-Heartleaf and Siberian bugloss, this plant is a stunner for its delicate foliage. The broad, heart-shaped leaves of ‘Jack Frost’ are dark green with a heavily frosted metallic silver overlay. 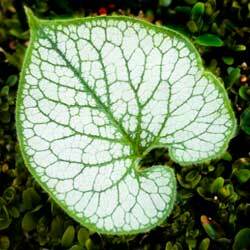 This allows only the green veining to peep through, giving the plant a crackle-like finish with a thin green border. Sprays of tiny bright blue forget-me-not like flowers burst forth in mid- to late spring, growing well above the foliage on delicate stems. Excellent in a woodland garden, the genus Brunnera is a group of classic perennials valued as a shade tolerant ground cover. The variegated forms are slower to spread than most other species, making this cultivar ideal for smaller spaces where crowding may be a concern, such as around younger trees, in smaller beds or in borders along a shady fence, deck or pathway. This plant is fabulous as a specimen plant or may be massed to show off its phenomenal floral display. ‘Jack Frost’ would also make a wonderful addition to a shady container garden on a deep porch or covered deck. The flowers are long lasting when cut and can be lovely, delicate additions to arrangements. Because this plant is resistant to deer and rabbits, it can also be a favorite in wildlife-friendly areas. Brunnera is a woodland plant, and that must be kept in mind if it will be able to show off its full potential in your landscape. ‘Jack Frost’ should be grown in full shade and consistently moist soil in southern regions to mimic the thicket-like conditions it naturally favors. In the north, morning sun is acceptable as long as the soil remains moist and the temperatures in the sun do not rise too high. Although tolerant of many soil types, this plant will grow best rich soil. If needed, amend soil with lush compost to improve its condition and provide proper nourishment. Little care is needed once Brunnera is established. Cut back the old foliage in the spring rather than in the fall; it will help to protect the crown during the winter. A winter mulch is also recommended to help keep the soil moist and warmer to protect the roots. Brunnera macrophylla ‘Jack Frost’ may not be widely known, but once you meet it, you’ll want to invite it to every shady part of your landscape!